I felt something funny happen inside me as a result of the 1997 dive season. This summer, we saw more horribly disfigured turtles than ever before. What I don't understand is that none of them were turtles we knew. Re-sighted turtles (we assume they're residents) are comparatively better off than many of the strangers we see. I don't know what that means. We've worked hard over the years to stifle our emotions and learn the ways of science. We know how important it is to hang back and be objective. I think that's when something snapped inside me. Such continual and intense contact with disease on animals you've known for years takes its toll. Such continual and intense contact with disease on animals you've known for years takes its toll. Most of the time, the emotional cost is erosive--slow but unrelenting. Then you catch the sight of a new unfortunate so profoundly afflicted that it can barely swim, and you gaze at the creature with a potent mix of shock and pity. Oh, every year we ponder the fact we could dive elsewhere where the turtles are healthy and we would be removed from the constant presence of disease and suffering. But perhaps this year more than any other, we’ve come to realize that we don’t go to Hawaii for a vacation any more. We no longer regard ourselves as tourists or as recreational divers. This season more than any other presented us with such disturbing sights that we now realize what we have to do. We are here to bear witness to the suffering that fibropapilloma disease inflicts on these turtles. We regard it now as our job to make people aware of the effects of this disease on individual animals--individuals who, when you get to know them, have personal histories. The more we see of their lives, the more we recognize that they all have behaviours that make them unique from any other turtle. 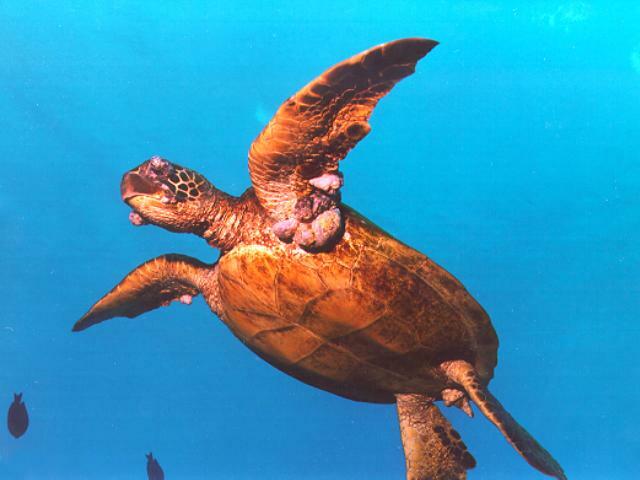 That green sea turtles can be regarded as individuals is still an exciting revelation. It also makes the impact of fibropapilloma disease that much more tragic. But the time we spend each summer underwater with them is an addiction all in itself. There is such a powerful need to know what is going on in their lives--what behaviours we are missing when we're not underwater with them. There is a rush you get from discovery as they reveal their private lives to you. And you know they’ll only do that when you've behaved in such a way that they trust you. There is nothing we have ever done in our lives (Peter is 50 and I’ll be 48 soon) that has been so challenging and rewarding. For such profound satisfaction, we are indebted to the Honokowai sea turtle community, which we now estimate to have 70-80 individuals. There used to be more, but they fell sick and "disappeared" over the years. With each new chapter in the Fibropapilloma Story, the plot sickens.